This is one post in an ongoing series of “how to” photo book tips, so be sure to check out the other posts! I’ve written before about incorporating things other than photos into your photo books here and there in my other posts and showed you examples of my layouts. For those of you who are traditional scrapbookers or former scrapbookers turned digital scrappers, this post will be all too familiar. Scrapbookers love to collect not only photos but non-photo elements to add to their creations. If you’re a pack rat like I am, you hold onto ticket stubs, show programs, travel brochures, maps, product wrappers etc. as they help tell the story you’re trying to convey. I don’t know about you, but if I didn’t save these things, after a while my memory fades and details are lost. This layout was done entirely within the MyPublisher software, so don't worry about having to do layouts with outside software if you'd rather not. This is using one of the MyPublisher templates. This is a map I scanned from a brochure. 5) Pick up a few postcards of locations you visited. They can provide an interesting side by side contrast to your own photos. To take that idea further, but how about taking a photo of you holding a postcard in front of the actual subject of the postcard? I’ve also seen an interesting site where the person took an old photo and took a photo of it in the modern day setting. Folks are so creative! This layout required a little more layering and work to design, but it wasn't difficult. I did this one in an external program (QuarkXPress) and uploaded it as a jpeg to MyPublisher. So now that you’ve collected your ephemera (fancy word for scraps of paper you come across every day that are normally meant to be of limited use) what do you do with it? STEP 2: SCAN – I recommend scanning at 300 dpi in jpeg format. Here's a non-travel example - brides and grooms, don't forget to scan or take a photo of your invitation for your wedding album! 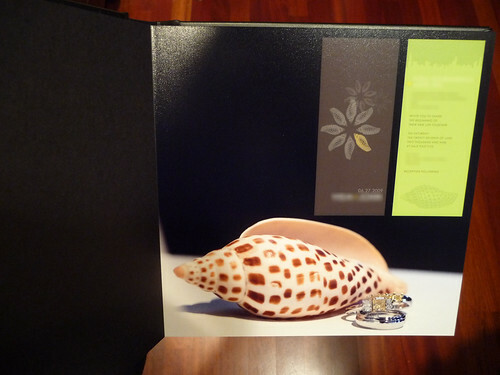 I scanned the front and back of my invite and just laid it out as a normal photo - this is my MyPhoto Creations flush mount wedding album. 3) Use the scanned items exactly like you would any other photo you’ve uploaded – they are in the same jpeg format, so they’re no different from your photos. 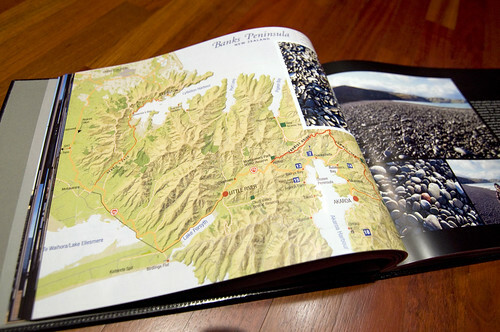 Share your finished photo book with your friends and family! I know there are a lot of creative folks out there – any other tips you have about adding non-photo elements? Please comment below! DISCLAIMER: PhotoBookGirl accepts no responsibility for turning anyone into a pack rat or hoarder. Collect at your own risk! Hey, just happened across your site today, and might be hooked! 🙂 I am a traditional scrapbooker who has switched to digital in the past couple of years, and I love this post on incorporating the memorabilia! Thanks! I have a question. When I prepare a full page layout in “indesign” and then save it as a jpeg to bring into the photo program I am using, what resolution does it have to be to come out sharp. If I save it at 300 dpi, it won’t upload to hotprints, for example . But if I save it at 150, will it come out sharp? I came across your website last week and am hooked! There is so much fabulous information, thank you!! 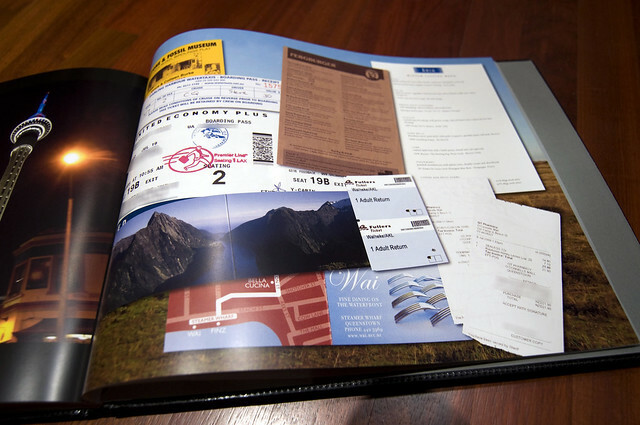 My question is related to tips on the actual scanning process – when I tried scanning some “ephemera” from my honeymoon (using Canon Pixma mp620), I couldn’t get the image to scan exactly to the size of the document itself. It was really strange but it kept cutting off part of the document when I scanned it, or would have a white box background around the image … any thoughts? Hi Joanna! We have the same scanner! 🙂 What I have noted about a lot of scanners is that it sometimes cuts off the edges – so I usually don’t line it up right on the edge – I move it in off the edge and in more to the center of the scanner. In terms of your items not having a transparent background, I would have to go back and look at that. Normally I’m taking my images into Photoshop or another editing program so I can’t recall off the top of my head whether there is a box around it. Are you scanning things that aren’t paper? There shouldn’t be if you’re laying your items that you want to scan directly on the glass. I think the Pixma software also has a crop function so you should be able to do that right in the scanning software. Additionally, I recall there is an auto detect that sometimes (but not all the time) knows that you’re scanning more than one photo/item at the same time so it automatically creates separate files for them. It should be in the preferences/settings for your scanner.